Download Hour1 Download Hour2 A trio of speakers this week, two of whom have been regular contributors to the show. We listen in on a conference that happened in California in 2011 entitled Earth At Risk. While they outline contrasting approaches to resistance, the speakers are united in their conviction that the culture of capitalist golobalisation has no mechanism for self-regulation and so Direct Action is necessary to stop its ongoing ecocide. (Earth at Risk is a yearly conference, for more information see The Earth at Risk website). We begin the show this week with Thomas Linzey, founder of CELDF, possessed of a wealth of knowledge about the US legal system, and environmental law in particular. After learning the ins and outs of the regulatory system while pursuing legal means to try to preserve the environment, Linzey explains, he gradually realized that it was never intended to save the environment but as a cosmetic adjunct to the whole legal system, the deep structure of which is oriented to expedite resource extraction by any and all means. He explains how he is now encouraging municipalities to pass ordinances which give priority to the desires and needs of the residents in local areas; regardless fo the fact that state governments have a habit of declaring such impudent behavior illegal, he says, these tactics are highly effective at teaching people what they are up against:- not a single rogue corporation, not isolated instances of greed but a system which fine words notwithstanding was never about protecting the many from the few but about preserving the privileges of the few and continuing the oppression of the many. The only miracle we're going to get is us, and this conference is about starting to make that miracle happen... Earth At Risk is a conference about fighting back. Then we hear an introduction to the conference by Derrick Jensen. He summarizes his ideas, that should be quite familiar to long time listeners of the show. Reviewing the ongoing ecocide has asks where will you draw the line? How much ecological devastation is too much? He appeals to our love for the natural world. We conclude the show with an uncompromising Aric McBay who paints a grim picture of what awaits if "bu$ine$$ as usual" is allowed to proceed unchecked. Climate change and resource wars are likely, he opines; a very ugly future awaits us if we do not take the actions necessary to check the ongoing ecocide and exploitation of the planet's resources. McBay describes how to effectively organise underground resistance movements and how these should relate to above ground movements. 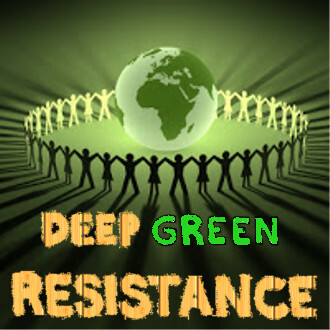 Whatever risk level you are happy with, he says, deep green resistance has a place for you, whether it is raising publicity and informing people about the ongoing devastation of life on earth, protesting and shutting down industrial facilities or direct attacks on key infrastructure to bring "bu$ine$$ as usual" to as fast an end as possible. Some of this episode's content is repeated in episode 681. This page was last modified on 21 August 2014, at 12:54.